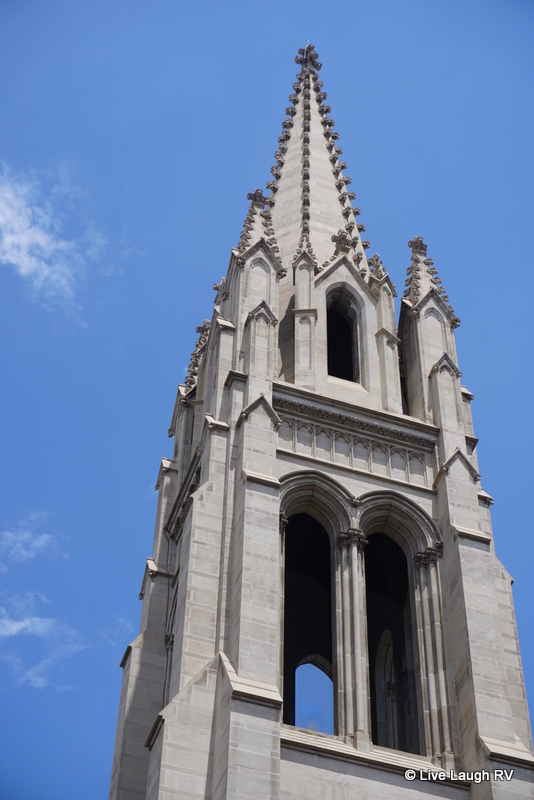 It was a warm and sunny Sunday morning and traffic around Denver, Colorado, was light; one of the main reasons we chose a Sunday to explore downtown Denver. We didn’t have any real set schedule in mind, just a desire to meander around the city. Even though we’ve called Colorado home for nearly twenty years, doesn’t mean we’ve spent much time in Denver. As a matter of fact, we’ve spent very little time in this lovely city. Having lived a two-hour drive south of Denver, traffic conditions and a firm schedule always kept us from slowly exploring this city. It was always hurry up, tend to business, and get back on the road before rush hour traffic or before the weather turns for the worse making traffic that much more challenging. Yep, always in a hurry. The beauty of staying camped in one location for a while is we get to slow things down. If the skies are threatening to let loose, we can stay put in our cozy little RV and move the plans to the next day. Fortunately, Colorado offers up plenty of gorgeous sunshine and thus opportunity to explore. With our home parked only a twenty minute drive from downtown Denver, we have no excuse not to explore this city in a leisurely manner. After reviewing my trusty little book – Moon Colorado (Moon Handbooks) I chose REI to be the first stop of the day. 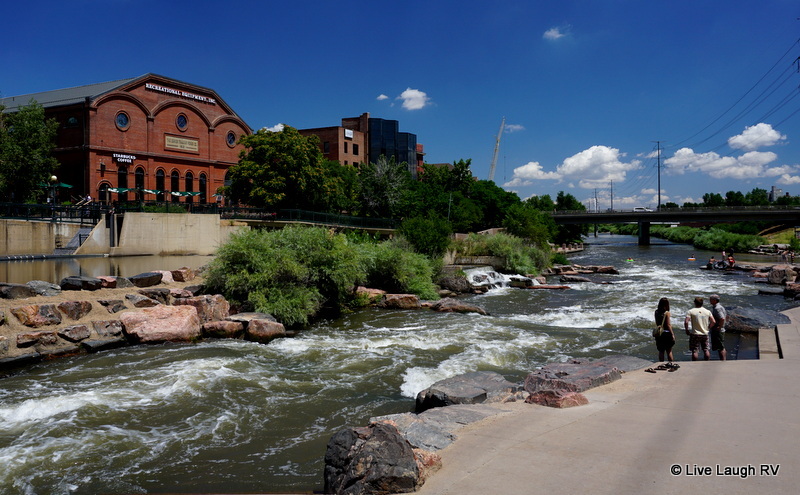 The REI Denver Flagship store can be easily seen from Interstate 25 and is located across from Confluence Park where Cherry Creek meets the South Platte River. The 90,000 square foot building is listed on the National Register of Historic Places. The building was once home to the Denver Tramway Powerhouse. The Denver Tramway Company built electric streetcar lines in Denver. 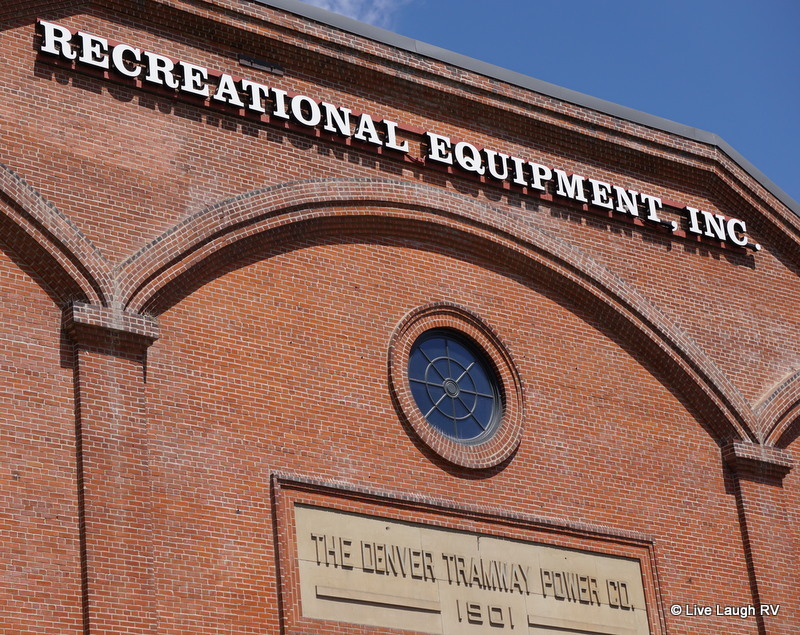 The Denver Tramway Powerhouse was built-in 1901 to house boilers and engines used to generate electricity for the rail system. As the automobile gained popularity, electric rail lines were removed from the streets of Denver and the Denver Tramway Powerhouse was closed in 1950. The building was then used as a warehouse and later as a museum. In 1998 REI (Recreational Equipment Inc.) purchased the building and after an extensive renovation the store opened to the public in 2000. 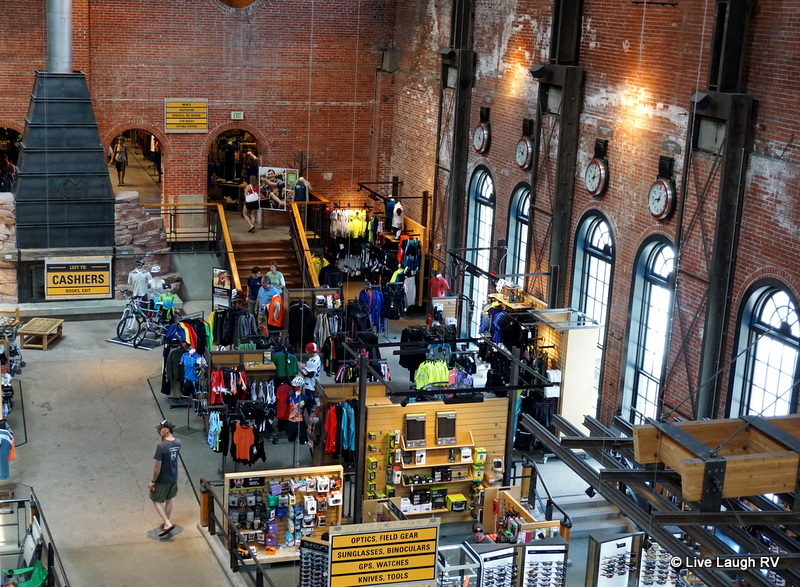 The REI Denver Flagship Store includes bike trails, a 45 foot tall indoor climbing wall, outdoor climbing features, and outdoor trails that wind through native plants and water features. On the main floor there’s a huge Starbucks with indoor and outdoor seating and the third floor offers a cute jungle gym to entertain kids. And let’s not forget about all the great products an outdoor enthusiast could ask for. 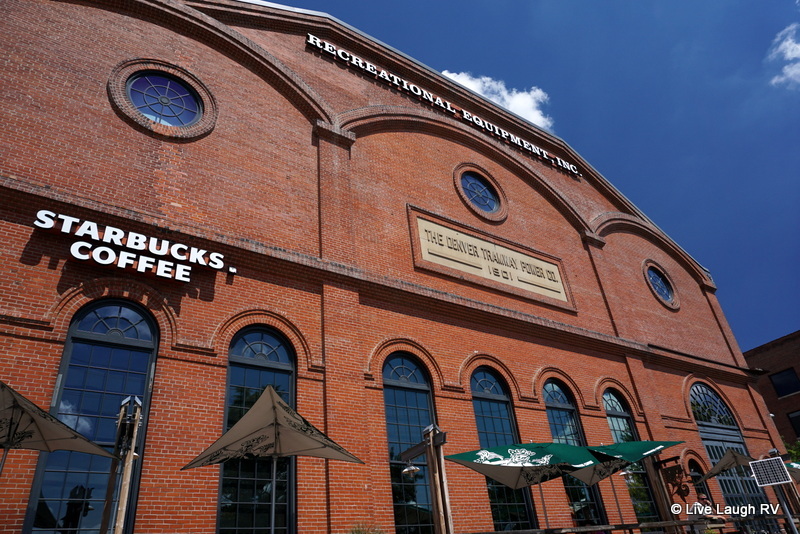 I would not normally classify a store on a sightseeing list, but this REI is an exception. Al and I found ourselves meandering around the REI store; inside and outside, for a couple of hours. While I was admiring the architecture, Al was admiring the views. Yep, I’d say this REI has something for everyone and is a must see stop for anyone visiting Denver, Colorado. And on another note ….. It’s obvious Coloradans love their outdoor activities. The Rocky Mountains offer a beautiful backdrop to the city of Denver and are a short drive away offering endless recreational possibilities. Colorado also offers plenty of festivals, 5K’s, professional sporting events, concerts, and abundant breweries to entertain just about anyone’s interest. But above all are the folks that love living in Colorado and appreciate all that it has to offer. That said, these folks discovered a unique way to commute to work. Instead of bike to work day, they’ve come up with Tube to work day. (be sure and click on the blue link for more photos and a video) How funny is this? Hope those suits were machine washable! I know what you mean about avoiding rush hour traffic. We live about two hours away from San Francisco. We’ll visit The City for day trips but want to be out of there before rush hour. It would be great to be a bit closer and explore it for a week at a time to get to see the little gems of the area. Here in Sacramento we have two local REI stores but they pale in comparison to the Denver store. I’ll definitely put this one on our to see list once we start our FT journey. What a luxury to be able explore at your leisure. Thanks for visiting my blog, by the way, and for liking it. It’s always fun discovering new blogs and it is a pleasure being able to slowly meander and explore new places. You bet I will be in Denver someday, Ingrid. I have never been to any place in Colorado except the airport. That REI is something and is really huge. I can imagine myself lost trying out stuff while Steve sitting outside waiting for me to be done. What an amazing store! Is that mountain in the center the 45′ climbing wall? Love REI..that store in Denver looks especially terrific! Eric and I really enjoy mixing up city adventures with nature adventures, too. Thanks for the tip on the RV park in Golden — staying nearby and taking public transportation into the city is definitely the way to go! I live in Denver and still love wondering around REI. Such a beautiful building and a very peaceful area. Thanks for the history lesson! I didnt know that past life of the building! Great post! My friends and I often wander around that REI when we’re in that part of downtown. Denver has been changed a lot since we visited there several years ago. I look forward to re-visit it in the near future. 🙂 Amazing store. I want to see more of Denver as well as Colorado in general. Thanks so much for sharing – Beautiful Captures 🙂 Happy Weekend! There’s so many things to see and do in Denver and within an hours drive outside of Denver that I don’t think I could narrow down a priority list of ‘must see’ things. Guess it just takes multiple visits! With all the scenery around the Denver area I probably wouldn’t take the time to visit the REI store, but from your photos, that would be a mistake. What a wonderful old building! Not only is the building very cool but the exterior surroundings are awesome. It’s definitely worth a stop and the supply of hiking shoes/boots is huge. 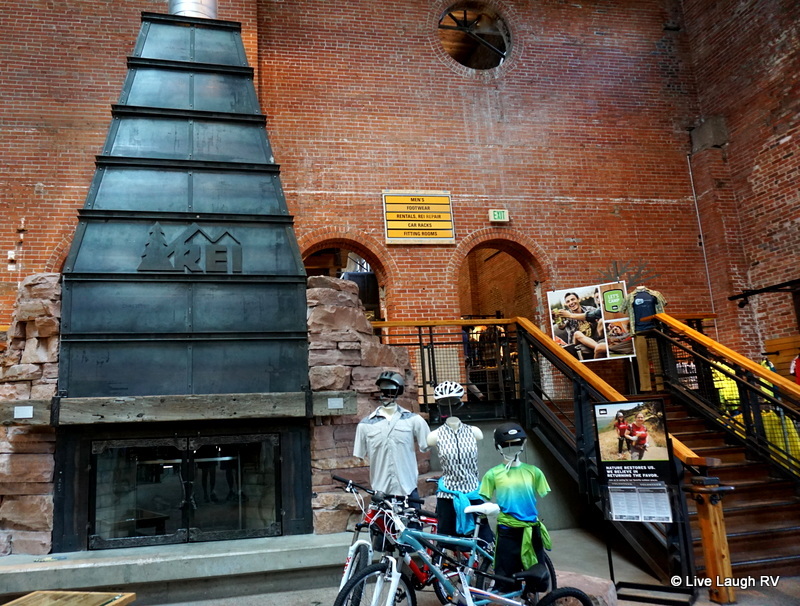 Biking trails in a REI store….wow! Hope they had some nice July sales going on. Tickled you get to explore such a beautiful city…how fortunate to be so close. I’ll remember the Sunday trick. 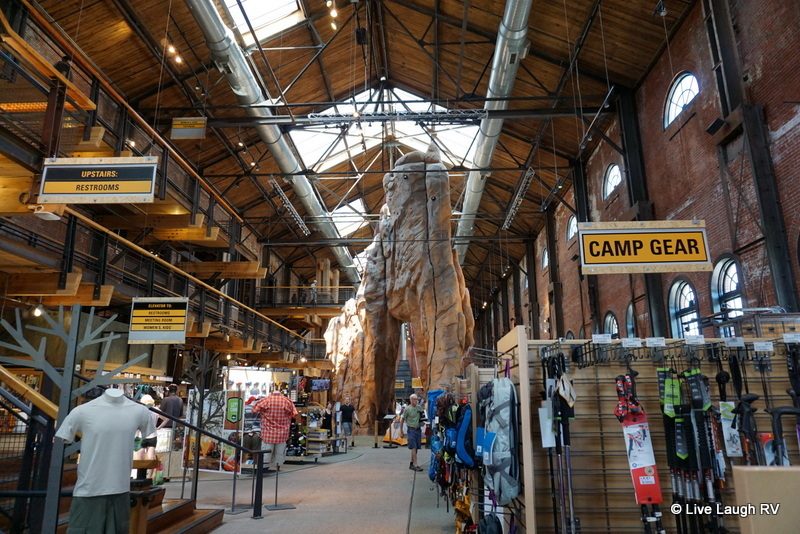 We love REI and will definitely be checking it out when we get to Denver later this year. I know what you mean about living so close and not taking the time to explore a city. I feel the same way about Denver and we lived right there. We have always thought that Denver would be a great city for living downtown, if one could afford a loft that is. We have been through Colorado quite a few times..usually hitting some National Parks and ending up in Colorado Springs…never made it to Denver per say…Like you and Al, we stay clear of big cities. Looks like a place with lots of history and that is my second love..Thanks for letting us ride along!! I’m getting my city mojo back. It’s taken me the past month to get into city dwelling after spending so much time in the hinterland. Al and I used to go into Chicago all the time when we were dating. So our day excursions into Denver has put us into the ‘dating mode’ …. not a bad thing after thirty some years, eh! 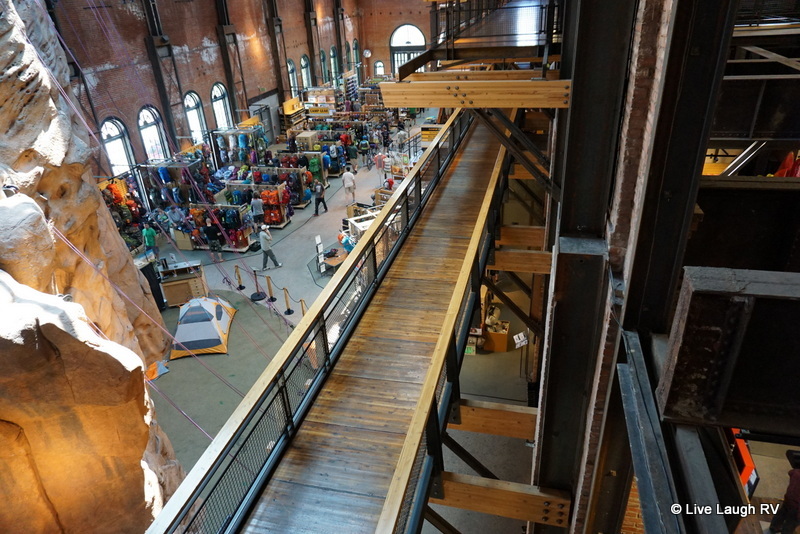 This REI store has a lot of unique charm and I loved exploring it just as much as I used to love going to the Marshall Fields on State Street. Hopefully you’ll get to go on the next NEA Convention if it’s held back in Denver. Wonderful blog. Thank you for taking the time to share your travels with the rest of us. I hope to be full-timing in a year or two.